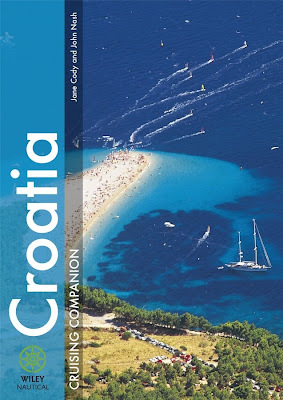 Sister site Croatia Cruising Companion covers updates to our book, first hand accounts of cruising Croatia from our readers, and news, views and comments on nautical Croatia. Today's Posting is about a feature in the latest Sunday Times singing Croatia's praise in a number of areas. We said in our book that Croatia merits a high ranking place amongst the world's top cruising destinations and the word is well out! Hopefully the Croatia Cruising Companion will help you get the best out of Croatia's sailing heartland - the Dalmatian coast and islands. It was something of a surreal experience travelling back on the London tube this evening carrying a “goody bag” from the Split tourist office. No less surreal was discovering some more secrets of Split within the very hospitable confines of the Croatian Embassy by Fitzroy square. Just to reinforce the many links between Croatia and the United Kingdom, we learnt that Fitzroy Square was Robert Adam’s next project, after he had finished discovering the Diocletian Palace, and hides a few fragments from Split. 1. It appears that that many of the state of the art skills, particularly in stone masonry, expounded and led by those restoring the Peristil in Split, were inspired by training and education at Weymouth College In Dorset. The faithful restoration of the Peristil is still a work in progress and it seems there are many more treats to come before the summer of 2012, the ultimate deadline for all phases. 2. There is a fascinating and already well researched theory that Diocletian’s Palace may have been more of a factory for the production of imperial military uniforms, than a luxurious Emperor’s Palace. The most compelling evidence we heard, alongside plenty more, was the “productivity” of the aqueduct built to carry water from the river Jadro to the Palace. This was capable of carrying 130,000 cubic metres of water per day which would have served a residential population of 173,000, many times in excess of the population of a “normal” palace, but just about enough to meet the demands for the wool washing and dying required by the military. 3. Did Diocletian decide to be the first Emperor to choose early retirement or was retirement thrust upon him? Tonight was the first time we heard that he was anything other than an early “quality of life” merchant, rather than a victim of a the equivalent of a recession or political coup. 4. We learnt a little bit more about the details of the hold up on Split’s Riva reconstruction (see earlier postings) – we knew there were some new archaeological finds that temporarily stopped the clinical “refurbishment” of the sea front, but tonight we obtained just a little bit more insight into what they might have been, and wonder how the “modernisation” still managed to go ahead in a form that seems so out of kilter with the heart and spirit of Split. It appears that there was plenty of life and civilisation prior to the building of Diocletian’s Palace, and a thriving port directly in front of the palace where metallic “street furniture” and slippery, heat reflecting, paving stones now lie. One of the most important and uplifting message of tonight’s evening, and one that has been resonating the more we have got to get to know Croatia and all its gems, is Split as a prime example of one of Croatia’s living historical cities. Croatia has seen many civilisations come and go, and Split is (mostly) a great example of making the best of its heritage available to permanent inhabitants and visitors alike. Refreshingly, the head of Split’s tourist board, conveyed a very honest and insightful image of a Split that is faithful to the best of its culture and history, but continues to reap the rewards of ever changing circumstances whilst ensuring that people are at the heart of Split’s continuing intrinsic wealth. Vedran Matošić seems to have the balance right and let’s hope that his vision of Split’s tourism – event led but faithful to, and protective of, its heritage – will ensure the continuing prosperity of a great city. That message, in conjunction with strong signs that Split is empowering the best of professional help it can get to uncover, preserve and share yet more of its history, is reassuring. 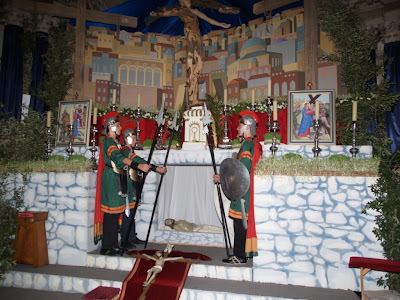 Easter is a very special time in Croatia, not least in the town of Vodice, near Šibenik, which stages a number of events, including a sailing regatta and the pageant pictured. Follow this link to the Vodice Tourist Board to find out more about this lively tourist town. We take our lead from today's photo - a mix of religious and military images - to note that Croatia joined NATO this month. No mean achievement after much hard work, continuing strategic and political importance, and the hosting of major NATO exercises back in September 2007 - see our posting of the moment, Croatia Online - NATO in Croatia 2007, when quiet fishing villages and warships seemed to live in relative harmony, and hopefully will continue to do so for many years to come. Sretan Uskrs (Happy Easter) to all our friends and readers. We've reported on the drive back to the UK a few times before - see Croatia By Car, August 2008 and Left Hand Drive Cars, December 2008. As long as you're not rushing and get in the right mind set it can be quite enjoyable - the time to clear your head and admire the scenery whilst changing cultures. It's a relatively easy trip from Split to London in 2 days and our benchmark is if we manage to get somewhere near Frankfurt on the evening of day one, a 4 pm ferry from Calais is easily achievable. We left at 5.30 am on day one, arrived 40 km short of Frankfurt by 7 pm and still found time for regular two hourly breaks. We left at 9 am the next morning and were back in London by 7 pm, building in the same regular stops. Total distance travelled 1850 kilometres; costs - petrol plus tolls plus vignettes (including the Slovenian rip off as per previous posting!) plus one night's hotel accommodation and ferry trip. Changes since the last time - looks like the motorway through Slovenia is taking shape and may hopefully be open by the summer, if not before. Similarly the two currently single lane long tunnels on the Croatian motorway - Mala Kapela and Sveti Rok - have a fighting chance of being dual carriageways fairly soon from the look of them.